Invisible Glass was developed with two simple objectives: superior cleaning power and “invisible” clarity. When you compare Invisible Glass to ordinary “blue water” glass cleaners, you’ll immediately see how quickly it removes even the most difficult grime, making glass virtually “disappear”. Use Invisible Glass to clean windows, mirrors, windshields, and other glass surfaces at home, work, and play. 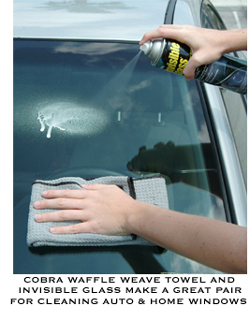 Invisible Glass is engineered with a multi-component formula that is more powerful than other glass cleaners. It quickly removes oily dirt, dust, fingerprints, sap, bugs, droppings, grease, adhesives, smudges, smoke haze, plasticizer film, pollutants, and other difficult grime. Other glass cleaners contain dyes, scents, soaps, and water. These inexpensive ingredients often remove just basic dirt and leave streaky residue which is difficult or impossible to remove. Invisible Glass contains NO soaps, foams, scents, or dyes. It evaporates quickly and completely, leaving glass clean and clear with NO streaks, haze, or residue. SAFE to use on original equipment manufactured (OEM) and most after-market TINTED windows when used as directed. Always test on non-glass surfaces before using. Not recommended for use on polycarbonate plastic.